The Islands of Ulithi. The four islands inhabited today are identified in red. See note on spelling, below. 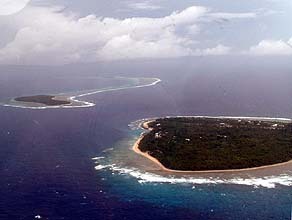 Ulithi is comprised of one main atoll, plus three outlying sections. 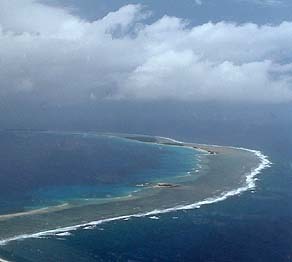 Falalop, the largest island, is technically outside the reef of the main atoll. The other two outlying areas include the "Turtle Islands" of Yeew, Bul'bul' and L'oosiyep, and a separate, mostly submerged atoll with the two islands of Giil'ab and Yaaor. Asor (left) and Falalop, the two "mainlands." 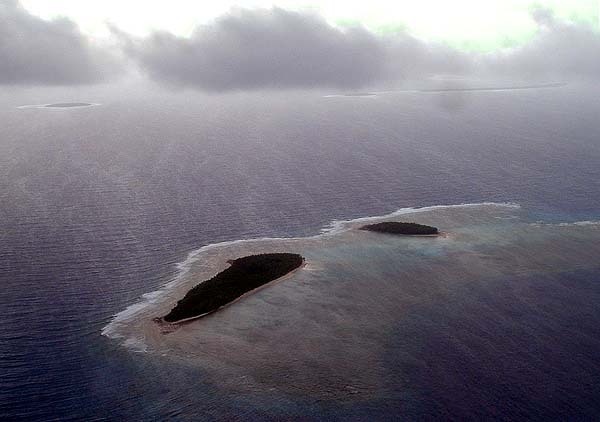 A portion of the Northern reef, showing Yeweech (foreground), Yangol’apl’ap, and Sohl’oay. ‘Now referring to the Turtle islands, at the south of the Ulithi Atoll," Mariano continues, "It also has a long submerged reef. We call this the dohoayiuyooer, now that too has the meaning ‘Southern submerged reef’." 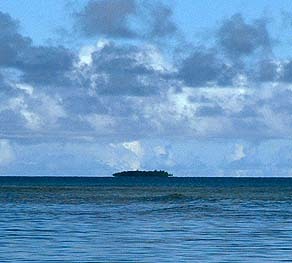 Looking across the atoll from the West. The islands of Pigl’eeal’ey and Yal’eepiig are in the foreground, with (left to right) Mangeyang, L'ool'ang, and Fedraey on the far side. "Generally speaking we now say 'part of Fedraey', since L’odow is no longer inhabited. Most all the people of L’odow are now residing on Fedraey. So, even these islands belonging to L’odow, we say ‘the islands of Fedraey,’ in general. Similarly, on the northern reef we say ‘the islands of Mogmog,’ though some of these islands of Mogmog belonged to now-uninhabited Sohlay. "So nowadays we are referring to the only four inhabited islands. And we say the ‘islands of such and such,’ and we name any one of the four inhabited islands." "These two islands here, Giil’ab and Yaaor, these are the Turtle islands," says Manuel. "Around March to June, that’s the time when turtles are coming up onto these two islands. Even daytime they climb up on the beach. Many, many, many turtles. "These islands are off-limits to most people. They belong to a family on Falalop. If we want turtle, we have to ask their permission. Many many fish there too, and to fish there, we also have to get permission from those same people. "All these islands where nobody lives, they are still owned by somebody. You cannot just go. If you want something, you have to ask the owner. They use those islands for copra to sell to YCA company in Yap, to get money. And for coconut crabs." The two outer sets of islands, and the submerged lagoon of Giil'ab and Yaaor. 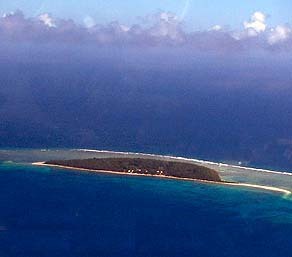 Piig Island, at the far Southern end of the lagoon. "The four inhabited islands include the Mainland which is Falalop. Asor is the next closest one, and Mogmog sits at the northern end of the atoll. And we have Fedraey at the southern end, though we say ‘western’ because it is west from Falalop. "From what I heard, when the Japanese got here and they wanted to have all the copra they could get from these islands, they wanted to watch over the people. So it was easier for them to pull the residents of each of these smaller islands onto a mainland, so when they put the people to work, they will have everybody together on these four islands. The people never went back after they were pulled out of their own small islands. They’re still visiting those islands for gathering, or to fish, but not really to stay." "Mogmog is considered the high island in term of chiefs and so the people of Mogmog are the highest of ranking people in the lagoon. They feel that they are responsible for looking after the people of Ulithi. "As the chief island, Mogmog still keeps the tradition of showing respect to the island. When we arrive there, before getting to the shore, if you’re wearing a mwarmwar, a lei, you have to take it down from your head. If you’re wearing Western clothes, like a shirt, you have to take it off. I wear a shirt, pants, short pants most of the time here on Falalop, but whenever I go to Mogmog I’ll have to change my shorts to a thu, and when we’re about to reach Mogmog, I have to take off my shirt. "Now that’s a sign of respect. And the people of Mogmog, you can see that even today, they don’t wear shirts or western clothing there. Even the ladies. But when they go fishing, the young men now can wear shorts. It’ll be easier for them to dive down, do spear fishing. But when they come back, then they put on their thu." "In terms of island size, Asor is bigger than Mogmog. And Asor is richer in soil than Mogmog. Now the name for the other islands, when they refer to the Mainland, which is Falalop here, they say wiliileg, it’s another term for just the right saying, 'big island.' Now they also term Asor as another wiliileg, when we talk about the island in terms of food, in terms of fertile land, fertility. "Fedraey and Mogmog are mostly sand. Mogmog, you’ll find a very thin, very, very, very, thin layer which you can call the top soil. After that, sand. Sand and gravel, like Fedraey. But on Falalop and Asor, they are more fertile. "Asor is considered to be a low island in terms of rank. It is considered something like the servants of Mogmog. Mogmog people consider Asor to be their island. They own the island. Fedraey is about on the same level." "Mogmog, Asor and Falalop are closer together. Although Fedraey is on the same extended reef, it’s farther than these three." 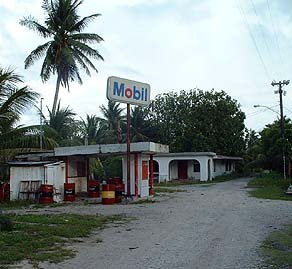 "Fais is considered part of Ulithi. Because you have to have that Fais chief, you have to have that Mangeyang chief, you have to have that Mogmog chief, so Fais is considered part of Ulithi. "Ngulu and Sorol are also considered part of Ulithi. 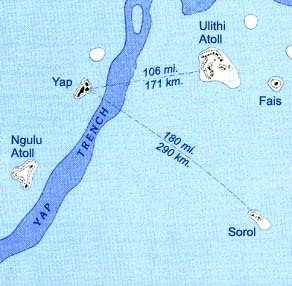 Sorol is almost like Fais, but Ngulu is really close to Yap, and the people of Ngulu speak both Yapese and Ulithian. So, there are political issues there. Yapese, they say they are responsible for Ngulu; Ulithians, they say they are responsible for Ngulu. On Ngulu they can speak both languages, though I’d say they have their own dialects." "Everything in East is ‘upper,’ in the upper or upward direction. West is downward. Then North and South are the side directions, and you can just say ‘out.’ In terms of walking, if you are going East you say ‘you go up there;’ Westward, ‘you go down there.’ And then North and South you just go. But you go ‘up’ to the East. You go ‘down’ to the west. "So on Falalop, if I say' I’m going up to the end of the runway,' without saying East, you know I’m going to the East end. ‘I’m going down to the end of the runway,’ tells you that I'm going to the Western end. But I will go out to the High School. These directions hold true for all islands." "I think Falalop is about a mile long and a mile wide," Chief Yatch explains, "and it is divided into two separate villages: Wiliileg and Paeliyaw. The road there, near the church, that’s the boundary. These villages are different from each other but we are all in one community." "The road that goes out from the Men’s House, that’s the division of each village," Mariano adds. "But in the old days, they have their own division which they know. Like an imaginary line that runs through the island. It doesn’t have to be in a very, very straight line. No. That imaginary line snakes through the settlement and that’s a boundary these people know. They know that they are members of this or that side of the village." "Falalop has two men’s clubs because we have two villages and two chiefs," says Manuel. It is the only island with two villages. Main Street, Falalop. The road going to the left behind the gas station roughly marks the boundary between the two villages. Central Mogmog village, showing the division between the two sides of the village. "Mogmog is divided into two parts," Phillip says. "We’ll call them the Eastern and the Western parts. And the Eastern part is called the Tabl'a Meterraael and it consists of several high-ranking families. The first one is from L'amwriuy, second is Faaelmey, and third one is Fall'ol', and the last one is Hadiyaar. "On the western side of Mogmog, Tabl'a Meealdow, we have L'amwdah, and we have Legfaaeliuy—we have two Legfaaeliuy, one is Legfaaeliuy Iimat, and the other one is Legfaaeliuy Iigap. And we have Fasilus. These people get together and plan with the chief or the King." We will learn more about the geography of Ulithi as we hear its stories. But first, we need to get there.